Warren Buffett is arguably the best investor in the world. His main holding, Berkshire Hathaway (BRK.B) has delivered market beating returns during his leadership. Buffett’s strategy is characterized by purchasing stocks which have a long-term durable competitive advantage in a stable industry. Buffett then holds on to these companies and reinvests distributions either back into the business or by purchasing new businesses. In a previous article I mentioned that Berkshire’s portfolio has likely generated over $1.30 billion in dividends in 2009. Some of its holdings included seven dividend aristocrats. Stocks which are included in the dividend aristocrat’s index represent companies which have raised dividends for over 25 years in a row. The companies included in the index represent some of the world’s most recognizable brands such as Coca Cola (KO), McDonald’s (MCD) or Procter & Gamble (PG). They have strong durable advantages, which have allowed them to increase profits and share the wealth with shareholders by consistently raising distributions, through several economic crises, oil shocks and asset bubbles. In addition to that these wide-moat companies derive substantial portions of their revenues globally, which makes them somewhat immune to local economic downturns. Exxon Mobil Corporation (XOM) engages in the exploration, production, transportation, and sale of crude oil and natural gas. The company is a component of the S&P 500, Dow Jones Industrials and the Dividend Aristocrats indexes. Exxon Mobil has been consistently increasing its dividends for 27 consecutive years. I would only be a buyer of XOM on dips below $60. Check my analysis of the stock. Lowe’s Companies (LOW) is one of the original components of the Dividend Aristocrats . The home improvement retailer which operates the United States and Canada has increased its dividends for 47 consecutive years. Three well-known dividend aristocrats raised dividends last week. The companies include Coca-Cola (KO), Abbott Labs (ABT) and Sherwin-Williams (SHW). Another promising dividend raiser included Swiss Company Nestle (NSRGY). In dividend investing it is important not only to concentrate on companies with solid competitive advantages, but also ones which grow earnings and dividends along the line. Nestle (NSRGY) engages in the nutrition, health and wellness sectors. The company is proposing a dividend increase of 14.3% to CHF 1.60/share ($1.477). This international dividend achiever has raised distributions each year since 1997. The stock currently yields 3%. Of the four stocks mentioned, Coca-Cola (KO) and Abbott Labs (ABT) are attractively valued at the moment. Sherwin-Williams (SHW) not only has a low current yield but also the last two dividend increases have been disappointing, making the stock a hold. Nestle (NSRGY) does look like a promising candidate for addition to a dividend growth portfolio, since it would also bring in some international diversification. I would place it on my list for further research. The McGraw-Hill Companies, Inc. provides information services and products to the financial services, education, and business information markets worldwide. The company operates in three segments: McGraw-Hill Education, Financial Services, and Information & Media. Just a few weeks ago this dividend aristocrat increased its quarterly dividend by 4.40% to 23.50 cents per share, which was the 37th consecutive annual dividend increase for the company. Earnings per share have grown at an average pace of 7.60% per annum. The company has also has repurchased 2.80% of its outstanding stock annually on average since 2001. For FY 2010, analysts expect the company to earn $2.63/share, which is higher than 2008’s EPS of $2.33. For FY 2011 analysts expect McGraw-Hill to earn $2.95/share. A reduction in the amount of debt being offered could affect the company’s Financial Services segment, which accounts for almost three quarters of its operating profit. Changing regulations and competitive environment could also affect this major segment, which includes the Standard & Poors brand. The remaining 16% and 7% of operating profits are achieved from the company’s education and media segments. Annual dividends per share have increase by an average of 7.50% annually, which is in line with the growth in earnings. A 7.50% growth in dividends translates into the payment doubling every almost ten years. McGraw-Hill has managed to double its distributions every eleven years on average since 1988. The return on equity has fluctuated between a low of 12.80% in 2006 and a high of 55.30% in 2008. Over the past few years it has remained above 30%, which is impressive. McGraw-Hill currently trades at 14.50 times earnings, has an adequately covered dividend, and yields 2.60. I would consider adding to my position in McGraw-Hill on dips below $31.30. Many dividend investors focus on the dividend aristocrats, the dividend champions and the dividend achievers lists, as a starting point in their research. While most investors picture dividend stocks as slow growth and boring utility stocks, the three lists portray a different perspective. The dividend achievers list, which focuses on companies which have raised distributions for at least 10 consecutive years, consists of slightly less than 300 individual issues representing almost all industry groups out there. The dividend aristocrats list, which features companies which have boosted distributions for over a quarter of a century, is also sector-diversified. 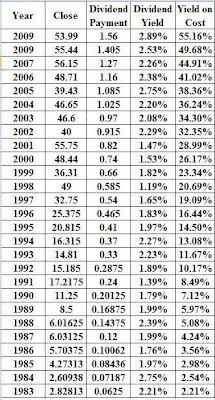 The dividend champions list also focuses on companies which have raised distributions for over a quarter of a century. I find the champions list more inclusive, whereas the aristocrats list has not included certain companies despite the fact that they have increased distributions for over 25 years in a row. Sometimes it is challenging to determine the actual record of dividend raises, especially when two companies merge. Diebold (DBD) engages in the development, manufacture, sale, installation, and service of automated self-service transaction systems, electronic and physical security systems, and election systems and software worldwide. The company recently boosted its dividend for the 57th year in a row. Yield 3.70%. American States Water Company (AWR), through its subsidiaries, provides water and electric utility services to residential and commercial customers in the United States. The company engages in the purchase, production, and distribution of water. The company has raised distributions for 55 years in a row. Yield 3.20%. Northwest Natural Gas Company (NWN), doing business as NW Natural, engages in the storage and distribution of natural gas in Oregon, Washington and California. The company operates in two segments, Local Gas Distribution and Gas Storage. This utility company has increased dividends for 54 years in a row. Yield 3.90%. Genuine Parts Company (GPC) distributes automotive and industrial replacement parts, office products, and electrical/electronic materials in the United States, Canada, and Mexico. It has four segments: Automotive, Industrial, Office Products, and Electrical/Electronic Materials. The company has consistently boosted dividends for 53 years in a row. Yield 4.20%. Integrys Energy Group, Inc. (TEG), through its subsidiaries, operates as a regulated electric and natural gas utility company in the United States and Canada. This utility company has increased dividends for 51 years in a row. Yield 6.60%. Vectren Corporation (VVC) provides energy delivery services to residential, commercial, and industrial and other customers in Indiana and Ohio. This utility company has increased dividends for 50 years in a row. Yield 6.00%. I did check with the Moody’s dividend achievers handbook and each company’s website in order to confirm whether the companies have actually raised distributions for 50 years in a row. I didn’t include Parker-Hannifin Corporation (PH), despite the fact that it was on the champions list, because it failed to increase dividends in 1991. (Update in 2017: Note that Parker-Hannifin's track record is based upon dividend payments for its Fiscal Year rather than the Calendar Year. The fiscal year runs from July 1 to June 30. Just because a company has raised distributions for 50 years does not necessarily mean that it would continue raising them for over a decade. Back in early 2000’s Winn-Dixie (WINN) had the longest record of dividend increases, after boosting its payout for over 56 years. The company was losing market share however and was heavily leveraged, which ultimately lead to its filing for chapter 11 protection and wiping out all shareholders equity in the process. The positive factor in the story is that there is a chance that some of the best dividend stocks of today which are included in the dividend achievers or the dividend aristocrats lists could end up raising distributions for 40 more years. Even if a company drops from one of those elite dividend indexes, it typically does so either because it is acquired by a competitor at a handsome premium or because it simply freezes distributions. Kellogg’s (K) is a nice example of a company which had raised distributions for over 44 years, before freezing distributions in 2001. The company then started raising distributions again in 2005 and has been boosting its payout ever since. Many investors believe that successful dividend investing consists of identifying the highest yielding stocks in the market and then generating double digit returns on investment each year. The problem with this strategy it that it often overlooks the fact that such dividend yields are most often unsustainable in the long run. A much better strategy that could eventually produce double digit yield on cost to investors is dividend growth investing. Using this strategy a patient investor accumulates a diversified portfolio of stocks which have a long history of consistently growing dividends. The positive factor is that any investor can implement this strategy, especially now that brokerage commissions are almost zero. Dividend investors are paid for holding common stocks, which is one reason why a company which keeps paying a stable or rising dividend does not fall as much during bear market declines. The dividend returns are always positive, which provides a safety cushion even in the worst times possible. Furthermore dividends cannot be faked, whereas earnings could be massaged within certain limits in order to reach performance targets that are not economically prudent. This return can be reinvested which further magnifies long-term income growth as well as total returns. Companies that raise dividends also provide a tangible proof that companies do have the cashflows to pay them. A company which does not have a solid business model typically cannot afford to raise dividends for more than a few years. Paying dividends also imposes a discipline upon companies, which restricts excessive empire building or "diworsification" through overpriced acquisitions. Opponents of dividend investing often claim that dividend stocks are boring and slow moving, and instead recommend purchasing fast growing rising stars, which reinvest everything back in their business. While re-investing back into the business is a good idea, expanding too rapidly might lead to excessive leverage build up with disastrous consequences for the owners of the business. Any solid company should be able to balance its capital investment needs with its shareholders demands for returns on their investment. Successful companies such as McDonald’s (MCD) and Wal-Mart (WMT) have not only grown their business in a smart way, but have also rewarded shareholders consistently as well. Currently, the market is a little overextended off of its March lows. Many investors are wondering whether they should cash out or keep adding to their positions. Dividend investors on the other hand have the luxury to ignore market movements as long as distributions are intact and growing. After all solid companies with definite competitive advantages which throw off rising dividend payments each year do not lose their moats overnight. Such companies include Johnson & Johnson (JNJ), Procter and Gamble (PG), Chevron Corporation (CVX), Pepsi Co (PEP) and McDonald’s (MCD).